Interstate 635 (I-635) is a 37-mile-long (60 km) partial loop around Dallas, Texas, in the United States between I-20 in Balch Springs and State Highway 121 (SH 121) at the north entrance of the Dallas-Fort Worth International Airport in Grapevine. It intersects I-35E at exits 27B–C, but does not connect with I-35W. Portions of I-635 and I-20 are collectively designated as the Lyndon B. Johnson Freeway; known locally as the LBJ Freeway, or simply LBJ. The roadway is named after Lyndon B. Johnson, the former U.S. Senator from Texas, 37th Vice President, and the 36th President of the United States. Where I-635 ends at I-20, I-20 continues the LBJ Freeway designation heading west. Because the portion of I-20 between Spur 408 to I-635 retains the same names as I-635, the two highways can be considered 3/4 of the beltway around Dallas. Together with Spur 408, a portion of Loop 12 (Walton Walker Freeway), and a portion of Interstate 35E, the Stemmons Freeway, I-635 and I-20 complete the beltway. I-635 signage on the Dallas North Tollway frontage road. Galleria Dallas can be seen in the background. I-635 begins at an intersection with I-20 in southeast Dallas, and travels northward through Balch Springs into Mesquite, where it intersects U.S. Highway 80 (US 80) and I-30. The route then turns to the northwest, continuing near the border between Dallas and Garland. Six miles (9.7 km) later is takes a general westward turn as it intersects US 75 at the High Five Interchange. The section from I-35E to US 75 (Central Expressway) is one of the busiest stretches of road in the Dallas-Fort Worth Metroplex, at virtually all hours of the day and night. The route continues west, intersecting the Dallas North Tollway and its original terminus, I-35E in Farmers Branch. The freeway then continues to the northwest, intersecting the President George Bush Turnpike in Irving before arriving at its final terminus at SH 121 at the north entrance to the Dallas-Fort Worth International Airport. 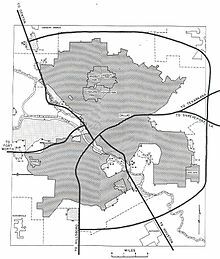 I-635 was originally designated by the Texas Department of Transportation in 1959 as a loop around the eastern side of Dallas, connecting with I-35E to the northwest and southwest sides of the city. In January 1969, the first section to open to motorists was a 10-mile (16 km) section from US 75 to Barnes Bridge in Mesquite[clarification needed]. In February 1970, the highway from US 75 westward to I-35E northwest of Dallas opened to traffic. The I-635 designation was truncated on December 2, 1971 when I-20 was rerouted south of Dallas, taking over 13 miles (21 km) of I-635's former route. The connecting section of I-20 from the west was not completed until 1978. Initially, the section between I-35E and US 80 in southeast Dallas was concurrent with I-20. When the outlet for I-20 from southeast of Dallas to Terrell was completed, the I-635 designation was removed from I-35E to its intersection with I-20. On April 1, 1968, Texas State Highway Loop 635 was designated from I-35E and I-635 to Spur 459 at the north entrance of DFW Airport. Spur 459 became part of a rerouted SH 121 on July 31, 1969. On July 31, 1974, Loop 635 was redesignated as part of I-635, and this section was opened in the 1980s. The High Five construction project (so called because it is five levels and rises almost 120 feet (40 m) above the lowest level), a rebuild of the interchange of I-635 and US 75, was opened for traffic in February 2006. This interchange carries over 500,000 vehicles per day and was built as the largest interchange in the state of Texas to handle this vehicle load. ^ a b c Transportation Planning and Programming Division (n.d.). "Interstate Highway No. 635". Highway Designation Files. Texas Department of Transportation. Retrieved April 2, 2012. ^ DeSimone, Tony (October 31, 2002). "Table 2: Auxiliary Routes of the Dwight D. Eisenhower National System Of Interstate and Defense Highways as of October 31, 2002". Route Log and Finder List. Federal Highway Administration. Retrieved September 9, 2007. ^ Betz, Jonathan (May 16, 2011). "HOV lanes close on LBJ Freeway as 5-year, $2.7 billion makeover begins in North Dallas". Dallas Morning News. Retrieved May 16, 2011. ^ Wheeler, Jason. "After long road, LBJ Express project set to open". WFAA. Retrieved 20 September 2015. ^ NTTA. "Trinity Parkway". Retrieved 20 September 2015. 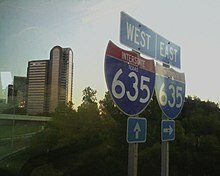 Wikimedia Commons has media related to Interstate 635 (Texas).